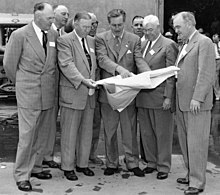 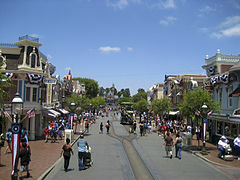 Main Street, U.S.A. is patterned after a typical Midwest town of the early 20th century. 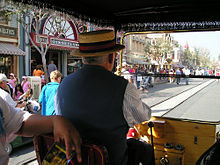 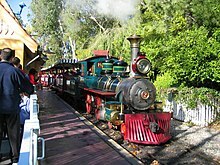 Main Street, U.S.A. has a train station, town square, movie theater, city hall, firehouse with a steam-powered pump engine, emporium, shops, arcades, double-decker bus, horse-drawn streetcar, and jitneys. 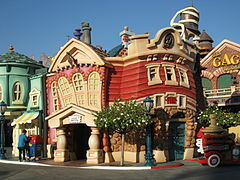 Main Street is also home to the Disney Art Gallery and the Opera House which showcases Great Moments with Mr. Lincoln, a show featuring an Audio-Animatronic version of the president. 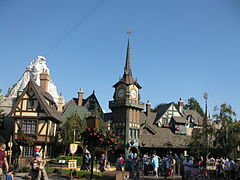 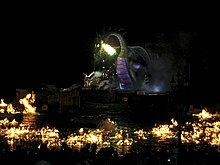 At the far end of Main Street, U.S.A. is Sleeping Beauty Castle, the Partners statue, and the Central Plaza (also known as the Hub), which is a portal to most of the themed lands: the entrance to Fantasyland is by way of a drawbridge across a moat and through the castle. 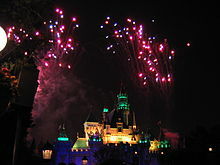 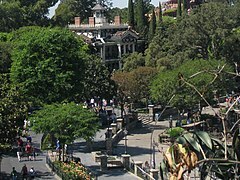 Adventureland, Frontierland, and Tomorrowland are on both sides of the castle. 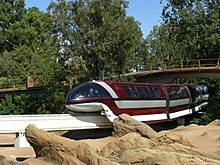 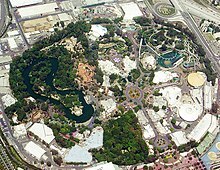 Several lands are not directly connected to the Central Plaza���namely, New Orleans Square, Critter Country and Mickey's Toontown.